November 2014 - ARC and NHMRC sections revised to show current grant compliance requirements and organisation nomenclature updated. This document outlines the procedures for financial management of grants to ensure research grant income is recorded appropriately in the financial statements of The University of Queensland. These procedures apply to all research grant income received by the University as well as the creation of all research projects. A project is required for every grant to separately identify the income and expenditure in the general ledger. The certified financial statements are prepared by Contract and Grants Accounting within FBS and grant funding is to be used in accordance with the grant conditions and University procedures. UQ Research and Innovation administer the research grants and are responsible for the processing, acceptance and recording of applications as well as research policy issues. Contract and Grants Accounting within FBS is responsible for the recording and reporting of research grant income. The organisational unit is responsible for the expenditure management of the project. The sign-off of a GRL can take a long time due to the complexities of contract negotiation, therefore the Pre GRL process enables research work to commence before formal sign-off has been obtained. Expenditure cannot be incurred until the start date of the project stipulated in the contract/agreement. Once the grant is formally established, the GRL will be issued and at this time the research project will become approved. If the project remains at Pre GRL status for more than six months, it will be reviewed monthly by Contract and Grants Accounting Section within FBS and a decision made by UQ R&I as to whether the project should remain open. ARC Linkage projects (which have matched funding from partner/collaborating organisations) are excluded from this process. Invoices can be raised in advance of the GRL by Contract and Grants Accounting Section within FBS, and will be held in suspense until the GRL is issued. At this time the income will be transferred to the project. A Project Request Form (Pre GRL) needs to be completed to create a Pre GRL project. Once a grant has been approved, UQ R&I issue a GRL advising appropriate authorisations have been obtained and the organisational unit finance officers can complete the project establishment proforma on the bottom of the issued GRL. Contract and Grants Accounting Section within FBS issue a research project upon receipt of the completed proforma, however the organisational unit finance officers will not be required to supply any additional information if a Pre GRL project has been previously issued. The invoice schedules and reporting milestones will be recorded in the Contract and Grants UniFi modules by Contract and Grants Accounting Section within FBS. If a research grant involves collaboration internally across organisational units, multiple projects can be created and linked via a summary project for reporting to the grantor. An Operational Unit Split Site Funding Form needs to be completed to generate the additional project/s. Changes to research grants such as Chief Investigator, dates and funding need to be forwarded to UQ R&I who will issue a Re-Record GRL communicating the changes. Invoices for all research grants are raised by Contract and Grants Accounting Section within FBS. The Chief Investigator will be notified by email if the invoice is conditional upon performance or progress reporting milestones. Invoices based on completion of milestones will not be issued until the Chief Investigator confirms completion. The University uses the accrual basis of accounting. Therefore income is credited to the project when grant income is deposited from a RCTI or when UQ raises an invoice to the grantor. Invoices raised by UQ are listed on the Accounts Receivable debtor's ledger and invoice payments are recorded on this sub ledger. General research invoices older than 200 days and ARC Linkage Partner invoices older than 120 days will be followed up monthly with the grantor by Contract and Grants Accounting Section within FBS. The Chief Investigator and organisational unit finance officer are consulted as to whether there is a known reason for the non-payment before contacting the grantors. 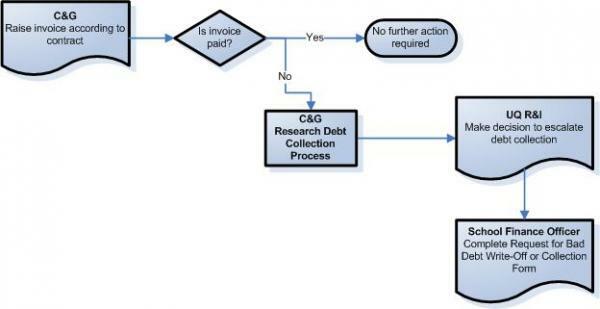 Unpaid invoices older than 240 days are reviewed monthly by the Director of UQ R&I to determine if the debt should be escalated to write-off or legal action. The organisational unit will be liable for these debt collection costs. The University will generally not agree to accept grants which specify that interest earned on the grant funds is to be credited back to the project. For those contracts that stipulate interest is to be credited to the project, interest is calculated on the monthly project credit balance using the thirty day average bank rate. This interest is allocated monthly to the project. Contract and Grants Accounting Section within FBS is responsible for the allocation all research indirect costs (overheads) as per the issued GRLs and according to PPL 4.10.12 Recovery of Indirect Costs from Research Funding and Consultancy Contracts. Contract and Grants Accounting Section within FBS is responsible for the payment of all research collaborative invoices. Where the University has agreed to collaborate with another institution on a research grant, a Collaborative Research Agreement or Multi-Institutional Agreement is signed by UQ R&I. Based on these contracts/agreements, transfers are made to the other institution on receipt of a tax invoice and where there are sufficient funds in the project to cover the payment transfer. Contract and Grants Accounting Section within FBS is responsible for the return of unspent grant income. If a grant has a condition that unspent funds are to be returned on completion or relinquishment of the grant, the unspent balance is held by the University as a liability until the funds are repaid to the grantor on receipt of a tax invoice. The organisational unit is responsible for the management of the project expenditure and must ensure that funds are spent in accordance with approved budgets and within the time limits imposed by the grant conditions. Only expenditure types approved in the grant contract should be charged to the project. Written permission should be sought in advance of expenditure not specified in the original budget. In such circumstances, the organisational unit should contact UQ R&I to approach the grantor for the necessary approval. It is also the responsibility of the organisational unit to ensure that the project expenditure is accurate and up to date at the end of each reporting period. When the project is completed and funds are unexpended, the refund of this amount is coordinated by Contract and Grants Accounting Section within FBS. Contract and Grants Accounting within FBS is responsible for the preparation of all certified financial statements in accordance with the conditions specified for all externally granted projects. Refer to PPL 9.10.03 Finance Reporting. The HERDC return is an annual collection of research income and publications data for the Department of Education. Contract and Grants Accounting Section within FBS collate the research income data and UQ R&I collate the research publications data for the HERDC return. The data collected is used by the Department of Education to assess the University’s overall research performance which in turn drives the allocation of Research Block Grants. Sustainable Research Excellence (SRE) program. The ARC annual financial statement is completed by Contract and Grants Accounting within FBS and is due the following 31 March. For any unspent funds greater than 75% of the combined balance of annual received income and previous unspent balance, the ARC require a carry forward request form and justification comment submitted with the annual financial statement. ARC funds must be expended on direct research costs in compliance with the grant conditions. Direct costs are expenses that are integral to carrying out the approved research objectives of the grant. Indirect research costs can only be expended to the grant upon prior written approval from the ARC. Individual NHMRC annual financial statements are completed by Contract and Grants Accounting within FBS and are due the following 31 March. From 1 January 2014 there is no longer a requirement for a justification if the carry forward of unspent funds is greater than 25%; the NHMRC may seek further clarification relating to the grant progress by exception. NHMRC funds must be expended on direct research costs in compliance with the grant conditions. Direct costs are expenses that are integral to carrying out the approved research objectives of the grant. Indirect research costs can only be expended to the grant upon prior written approval from the NHMRC. RIBG funding is provided annually by the Department of Education on a calendar year basis to eligible universities to enhance the development and maintenance of research infrastructure. The annual financial statement is completed by Contract and Grants Accounting within FBS and is due the following 30 June. A carry forward request is submitted with the annual financial statement and is collated by the Office of the Deputy Vice-Chancellor (Research). RIBG funds must be expended according to the grant conditions. This form is for interim access to a research project when there are delays in finalising contract documentation, obtaining signatures or obtaining ethical clearance. This form is to split a credit attributed to a research grant across multiple schools for the purpose of internal funding distribution.